Join us as thriller author, Jeff Abbott talks with Michael Connelly about the release of the new Harry Bosch novel, The Burning Room. Michael Connelly will sign and discuss The Burning Room (Little, Brown and Company $28). Connelly will sign copies of The Burning Room and 3 older titles per person. Due to the size of the crowd, there will be no second round. The Burning Room goes on sale November 3rd. Line Numbers will be available starting that day. A copy of The Burning Room must be purchased from MBTB in order to obtain a line number and get anything signed. Seating and parking are first come, first served. Please note that Connelly draws one of our biggest crowds every year. Chairs will be put out at 5 pm on the day of the signing. If you can't make it to the signing but would like a signed or personalized copy of the book, you can order one and we are happy to ship it to you. speaking & signing Inside Man Jeff Abbott, Edgar Award nominee, bestselling author and one of our favorite Austinites, returns to BookPeople tonight with his latest Sam Capra thriller, Inside Man. When Capra's friend Steve is shot dead outside his Miami bar, Sam is drawn into an intense family drama durrounding a powerful, unstable tycoon and children who may each hold murderous secrets of their own. It's always a good time when Jeff's in the store, don't miss it! All about Inside Man Following Adrenaline, The Last Minute, and Downfall, Jeff Abbott returns with the next riveting novel in the award-winning New York Times bestselling Sam Capra series: Inside Man. Sam Capra's friend Steve has been murdered, shot dead in the rain outside of his Miami bar. The only lead: a mysterious, beautiful stranger Steve tried to protect. To avenge his friend, Sam goes undercover into the Varelas, one of Miami's most prominent and dangerous families. Now on the inside, playing a part where one wrong move means death, Sam faces a powerful, unstable tycoon intent on dividing his business empire between his three very different children, who each may hold murderous secrets of their own. Sam is relentlessly drawn into this family's intense drama, amplifying painful echoes of his own shattered relationships as a son, brother, father, and husband. And just when he thinks he understands why the family is self-destructing, he discovers a lethal secret so shocking that the Varelas cannot let him walk away alive . . . Jeff Abbott is the acclaimed author of nine novels, including Fear, Panic, and A Kiss Gone Bad. Nominated for three Edgar and two Anthony Awards, he lives in Austin, Texas, with his family. Thank you for supporting Jeff Abbott, MysteryPeople & your local independent bookstore! Jeff Abbott will sign and discuss Downfall (Grand Central Publishing; $27). Jeff Abbott is the international-bestselling, award-winning author of thirteen mystery and suspense novels. Jeff’s novels have been called “exciting, shrewd, and beautifully crafted” (Chicago Tribune), “fresh, original… intricately woven” (Publishers Weekly), “nail-bitingly suspenseful and totally original” (Irish Independent) and “excellent” (South Florida Sun-Sentinel). He is published in many languages and has been a bestseller in the US, the UK, Ireland, France, Germany, Australia, Portugal, and other countries. Jeff is a three-time nominee for the Mystery Writers of America’s Edgar Allan Poe Award and a two-time nominee for the Anthony Award, given at Bouchercon (aka the World Mystery Conference.) His novel Panic was also been nominated for Best Novel for the Thriller Award. All of Jeff’s Whit Mosley suspense novels have been honored with nominations for major writing awards: A Kiss Gone Bad was short-listed for the Anthony Award; Black Jack Point was nominated for the Edgar, Anthony, and Barry Awards; and Cut and Run was nominated for the Edgar Award. 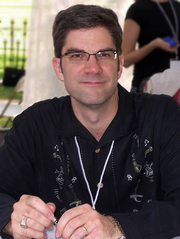 Jeff’s first novel, Do Unto Others, won both the Agatha Award and the Macavity Award for Best First Novel. His other books include The Only Good Yankee, Promises of Home, and Distant Blood. Jeff’s short stories have been anthologized in collections such as Best American Mystery Stories and The World’s Finest Crime and Mystery Stories. His novels Panic and Collision have been optioned for film and are in script development. Jeff graduated from Rice University with a degree in History and English, and worked as a creative director at an advertising agency before writing full-time. He lives in Austin with his wife and two sons. Marcia Clark will sign and discuss her new book Killer Ambition (Mulholland; $26). Marcia Clark is a former Los Angeles deputy district attorney who was the lead prosecutor on the O.J. Simpson murder case. She cowrote a bestselling nonfiction book about the trial, Without a Doubt, and is a frequent media commentator and columnist on legal issues. She lives in Los Angeles. Bestselling Author Jeff Abbott Speaking and Signing Downfall She is a good mother. She will do what she must to ensure that her daughter Diana has a perfect life, just as perfect as the one they've led for the past seven years. No matter who has to die. About Downfall: The simplest beginnings can unravel a life. For Sam Capra, it is the moment a beautiful young woman walks into his San Francisco bar. Sam doesn't want trouble. An ex-CIA agent, his only desire now is to build a quiet, peaceful home for himself and his infant son. But Diana Keene is no ordinary customer. She's pursued by two gunmen, and when she finds Sam, she whispers an urgent, desperate plea: "Help me." And without any warning, Sam is thrust into a fight for his life. For Diana is being hunted by a deadly network-a shadowy alliance of select, influential men and women who use their connections, their authority, and their wealth to bend the world to their will. Now, this network aims its relentless fury against the man interfering with their plans to seize a new level of power: Sam Capra. Threatened on all sides, Sam has only one hope to survive the network's all-consuming attack and return to his life with his son....he must destroy the man who owns the people who run the world. Thank you for supporting Jeff Abbott, MysteryPeople and your local independent bookstore! Jeff Abbott signs The Last Minute . Agatha and Macavity Award winner Jeff Abbott began his career writing traditional detective novels. As his career progressed, the Rice University graduate changed pace and more recently delved into the thriller fiction genre, including his Sam Capra series. The Last Minute is the follow up to Adrenaline and has been called “beautifully crafted” by The Chicago Tribune and “intricately woven” by Publishers Weekly. Tough stories with hard hombres and dangerous dames, where survival trumps virtue, no matter what side of the law you are on; this is what you’ll find in the Hard Word Book Club. Scott and Joe will guide you along the last Wednesday of every month at 7PM. This month’s book is Adrenaline by Jeff Abbott. Jeff Abbott will be speaking at this meeting. Jeff Abbott reads from Collision. Jeff Abbott's book Inside Man was available from LibraryThing Early Reviewers. Jeff Abbott @ Stop, You’re Killing Me! Jeff Abbott is currently considered a "single author." If one or more works are by a distinct, homonymous authors, go ahead and split the author. Jeff Abbott is composed of 5 names. You can examine and separate out names.